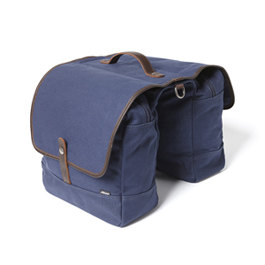 We create stylish and robust bags for people who cycle. Inspired by a British vintage and workwear aesthetic, Alban bags are made from traditional materials, but deliver modern performance. No nonsense, versatile and understated, our bike bags are constructed using 18 oz. coated canvases and twills, veg tanned bridle leather straps, trims and detailing and brass hardware. Designed to keep your belongings safe, dry and packed away in style, our bags are for use on and off your bike. Our design ethos is a marriage of simplicity and function; clean lines and classic silhouettes, with a signature double layered base offering extra protection and durability. Alban Bike Bags are available in a range of practical and timeless colourways, designed to match your bicycle, and your wardrobe.